This command will run the script requestCounter.js in the part1 directory in the repo found in GitHub at the URL specified. It passes an additional environment variable APP_PORT to the runtime – to be used in the node application (process.env.APP_PORT). It maps port 8080 inside the container to port 8005 on the host in the standard Docker way. The same image is started, passing a different GIT_URL and different instructions regarding the directory and the script to run – and also a different environment variable called PORT. Note: this work is based on the Docker Image created by jakubknejzlik – see https://hub.docker.com/r/jakubknejzlik/docker-git-node-app/ and https://github.com/jakubknejzlik/docker-git-node-app/blob/master/Dockerfile. My own sources are part of the GitHub Repository at https://github.com/lucasjellema/microservices-choreography-kubernetes-workshop-june2017 – with resources for a workshop on Microservices, Choreography, Docker, Kubernetes, Node.jS, Kafka and more. 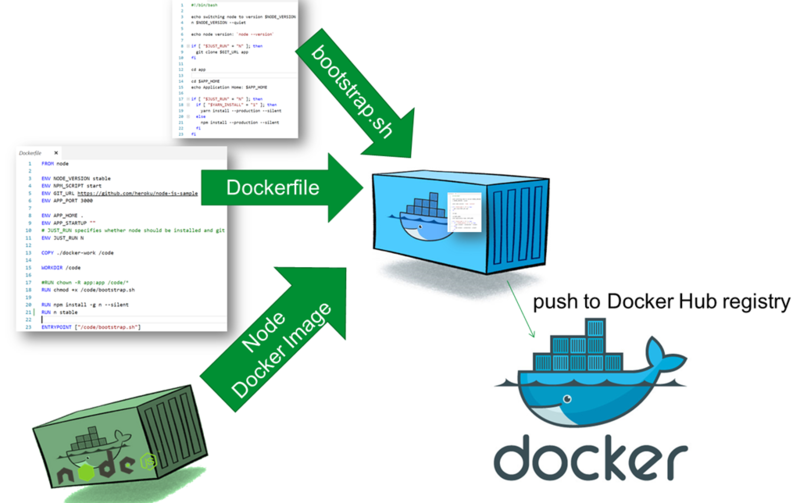 It starts from the Docker Image node – the official base image (see https://hub.docker.com/_/node/ for details). The scripts defines a number of environment variables with (default) values; these values can be overwritten when a container is run. The contents of directory docker-work (off the current working directory) is copied into directory /code inside the Docker image. The file bootstrap.sh – which is in that docker-work directory – is made executable. NPM package n is installed (https://www.npmjs.com/package/n) for doing version management of Node.js and the currently stable release of Node.js is installed – in addition to the version of Node.js shipped in the Node Docker image . Finally, the entrypoint is set to bootstrap.sh – meaning that when a container is started based on the image, this file will be executed. In my environment, I am working on a Windows7 laptop. On this laptop, I have installed Docker Tools. I am running in the Docker Tools Quickstart terminal (fka boot2docker) – Docker Machine on a Linux client running a small Oracle VirtualBox VM. 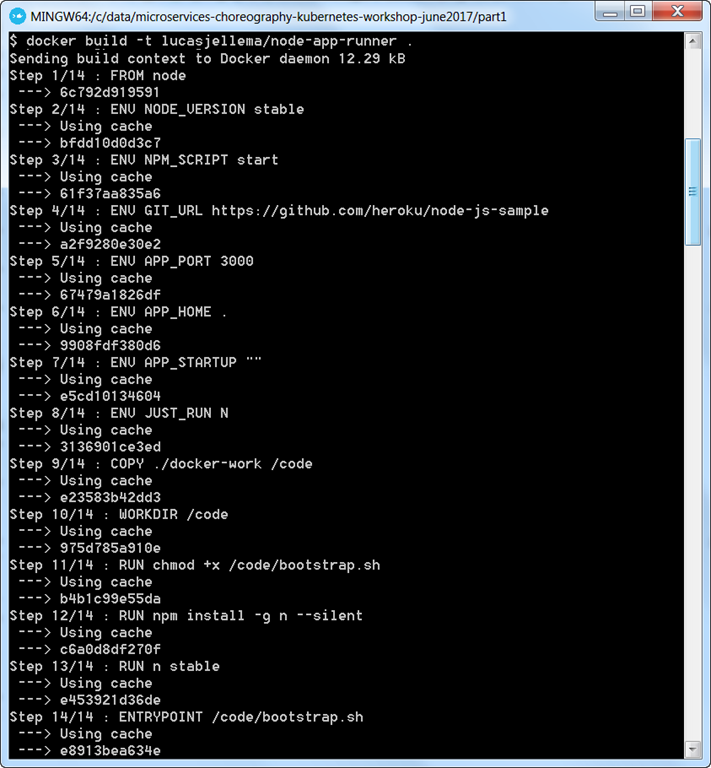 docker build -t lucasjellema/node-app-runner . 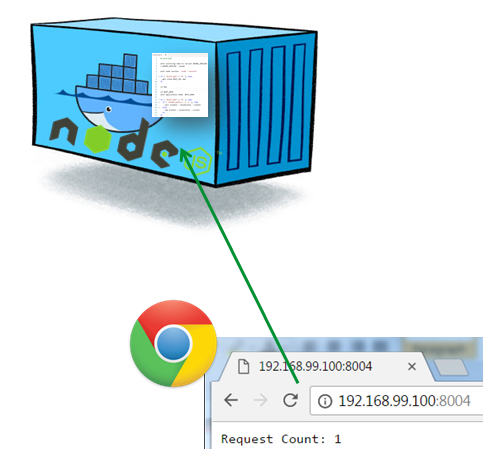 This runs a container, clones the Git repo at the indicated URL to directory /code/app , navigate into directory /code/app/part1, performs an npm install to get required modules and runs requestCounter.js with Node.js, listening at port 8004 for http requests on the host that are forwarded to port 8080 inside the container. which will return the IP address assigned to the VM. 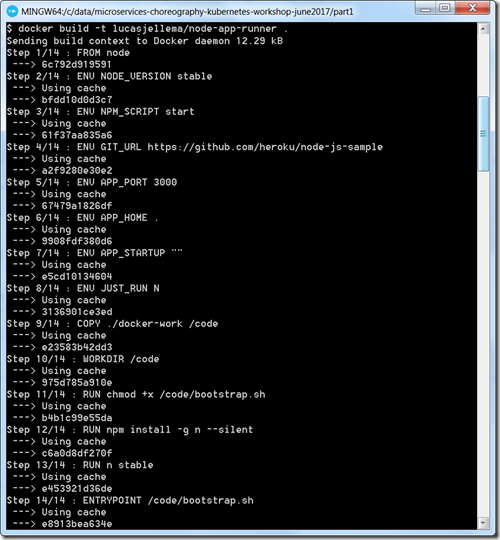 I can then access the Node.js application at http://IP_ADDRESS:8004. 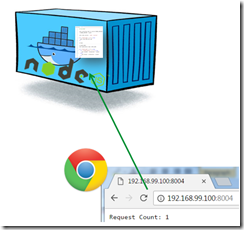 I have several Node.js applications that I would like to run – each in their own container, listening at their own port. 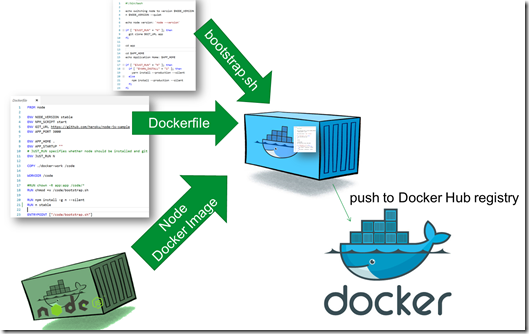 This is now very simple and straightforward – using several calls to docker run, each with different values for GIT_URL, APP_HOME and APP_STARTUP as well as APP_PORT or PORT.